Delight in the panoply of fun and thrill that is in store for you on Paws of Fury Instant! Join the pawsome Panda Sensei and let the latter guide you to the hidden path which leads to untold treasures. What’s unique? The outstanding visuals will have you oohing and aahing from the comfort of your seat. The background overlooks pink blossom which constantly floats across the scene. If you are the proud owner of a desktop, tablet or smartphone, feel free to have some good dosage of fun on Paws of Fury Instant, playable at Wicked Jackpots! Hmm, very simple! Hop over at Wicked Jackpots and log onto your account! Once you are set, look out for Paws of Fury Instant and select the preferred stake amount! Follow by hitting on the Play Button where you will find the stake deducted from the current balance. So, punters, ready to experience an excellent gaming time? Bet Levels: Paws of Fury Instant doesn’t offer any Bet Levels! Amount of Paylines Selection: You won’t find any number of lines as the game is an instant win. Coin Values: Feel free to select from a minimum stake of 0.50 up to a maximum stake of 20.00! Hit on each of the 6 coin icons to unveil a phenomenal cash prize. Unveil 3 equivalent prize amounts to reap one of those amounts. Hit each of the icons to unveil a symbol and an astounding cash prize. Keep a particular eye on the "Paws of Fury" symbol to reap the prize for that row. Unveil 2 numbers and a wonderful prize amount in a row. In each row, the left-hand number is YOUR number and the right-hand number is THEIR number. If it happens that YOURS is larger than THEIRS, you reap the prize for that row. Unveil numbers and a remarkable prize amount in a row. In the event that the 2 numbers in a row add up to 10, you will virtually lay your hands on the prize for that row. Hit on the icons to unveil a symbol. Unveil 2 similar symbols in a row to reap the prize for that row. 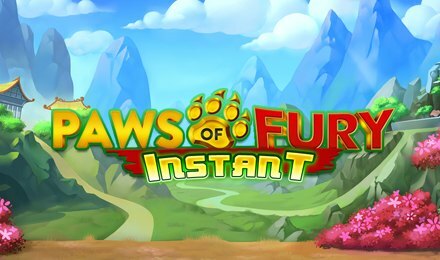 Let the mesmerising gameplay of Paws of Fury Instant blow your socks off!